If It's Too Loud...: Mary Bell - "Band-aid Baby"
Last year we discovered that there was a punk band out of Paris named after English child murderer Mary Bell. (By child murderer we mean a child who murders, not someone who murders children, although her victims were also children...) They are about to release a six song EP, HISTRION, in October. The first song off the new EP is currently available to listen to. "Band-aid Baby" might be the best 48 second punk song you ever hear. Somehow they manage to cram an entire song into such a short time frame. "Band-aid Baby" brings the same fury and noise that we loved from their previous release, LP, but it's a little more fun. There is still darkness and anger, but almost as if they are channeling it into mockery more than aggression. You can listen to "Band-aid Baby" below. 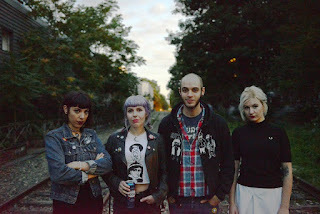 HISTRION, the new EP from Mary Bell, will be out in October. You can pre-order it via Bandcamp. For more on Mary Bell, check out their website.